This post was inspired by a conversation I had with William Chamberlain. 180 hours is 4 1/2 "regular" work weeks. Basically, one month of work. That's how much time a typical teacher will spend with a student during one school year. When you look at things from a time point of view, it makes you think about being intentional. What are you putting the most time into? What types of things can be cut to "trim the fat?" Are you teaching to learn or teaching them content? Are students creating from the content under your guidance or are they simply consuming content? This then leads to the question of... Maybe what teachers teach isn't all that important anyway? Maybe what happens inside the walls of a school really isn't all that important in the grand scheme of things? Did you know that the more shrimp flamingos eat the more pinker they get? I learned this today at the zoo. The dye in the shrimp that makes it pink makes the flamingos pink. Today, I was taught how to use our sitting lawn mower to mow our lawn. It is very fun. I learned there are many steps to doing this. I also learned you have got to take caution while doing this and you can't rush through the job. Today my grandpa MADE me pick up walnuts today. Good news is that I didn't stain my fingers! I wore gloves, so no stained fingers for me! Over Break, I learned that research shows that laziness is just a natural part of being a teen. It does not, however, reflect bad behavior! First, put 1 finger on the edge, then put the rest of your fingers under it. Put your thumb on top, twist your body and release. From the zoo trip today, I learned that orangutans have cultures as well. Their mothers teachr them a lot of their life skills. I also learned a really interesting fact about how two groups of orangutans live on opposite sides of a large river. On one side the orangutans have learned how to eat a poisonous fruit without getting stung and passed it on to their offspring. The other group on the other side of the river has never learned this so they don't eat the fruit. I learned on Saturday and Sunday that playing in a travel softball tourney is a lot harder than a regular season tourney. So intense! I learned that on a lowercase i the dot is called a tittle! I learned how to not get annoyed at commercials. All you have to do is 1 mute the TV then mimic what you think there saying then when the show goes back on all you have to do is turn the sound back on. Only 22 countries have never been invaded by Great Britain! I learned that Winter the dolphin only wears her prostatic tail for therapy and when she relaxes she sort of floats on her side. I went to the beach on Thursday and learned that catfish live in the ocean and when I had caught it almost horned the people that took it off! Now I wish I was still in Florida's weather was warm. I learned how to swim with manatees and I even got to pet one calf(baby manatee).Sometimes it takes 5 minutes to find one and sometimes it takes 3 hours. I learned how to babysit my little brother.Babys need love and care and they need to know that someone is going to be there with them every step of the way.Even though they they cause trouble you can,t stay mad at them they don,t know any better. I learned how to hook up a PS3 to our T.V. My sister came over for a couple of days so she brought their PS3. It is really easy and fast to hook up. Today, October 20, I had what is called a tonsilectemy. Basically they removed my tonsils that were in the back of my throat. The key was to stay calm and relax. They put you to sleep and when you wake up, it is all done! A funny thing about my surgery was they give you a certain type of medication that makes you kinda loopy. Well according to my mom, I told her that I was seeing fireworks exploding in my face! I crossed the mississippi headwaters in Itasca state park, Minnesota. During Fall Break Laney and I went to the Ripley's Aquarium in Gatlinburg. In the aquarium there was a section where you could touch the moon jellies. On the top of the moon jelly there are four circles. To touch it without getting stung you touch it right in between the four circles. Which will cool you down more ice cream, hot cup of tea, room temperature cup of water, or ice-cold sports drink (Gatorade)? The correct answer is actually a hot cup of tea because the hot cup of tea makes you sweat that makes you cool down. I learned this after watching a show called The Hungry Games on Food Network. This show proves to people that when eating food it is just all up in your head. If you were to have ice cream the ice cream would make your vessels constrict which makes you hot. It may sound backwards but, it is true. Over fall break I went to Disney World and while I was there I learned that the Carousel of Progress was taken to the World's Fair by Walt Disney. It became a smashing hit so, he brought it to Walt Disney World. It is in Tomorrowland of Magic Kingdom. The Carousel of Progress is a show that shows through the 20th century to see technology improving through the years. Jonny my brother and me went to the Elementary and played at the basketball goals it was fun but at the end I started to just shoot threes and I kept making them and now i now when and where I release the ball for a 3 pointer. Over my fall break I got a huge gash in my tire of my car. This is how to put air in it and drive on it long enough to get it fixed. First you need to pull over somewhere close to you. Then you need someone to get you 2 cans of fix flat from the gas station. Next you put in in the air hole and when you get done with both cans you put air in it. Then after that you drive it to the tire place where you got your car from and got it replaced. I learned a better serving form at volleyball practice. I also learned a better way to practice spiking a volleyball. I learned that in Disney movies there are hidden characters. My mom told me this and I had no idea. Then I looked at it on the Internet. Here is a picture of Rapunzel and Flynn in Frozen when Anna is singing "For the First Time in Forever"
Me and Bobby went to the zoo and we learned that you should never Throw leaves and hiss at the Male lion that is sleeping because the lion will try to attack you and it kind of scares you at first. Prussia was once a German kingdom. But, Prussia today is now part of Germany, Poland, Russia, Lithuania, Denmark, Belgium, Czech Republic, and Switzerland. I learned that leaves change colors because the chlorophyll in them breaks down. So the green disappears. Causing the leaves to turn yellow red and orange! There are 196 countries in the world. Though Taiwan is not considered a country to many. There are about 6,500 languages in the world. But, about 2,000 of them only have fewer than 1,000 speakers. Canadians buy their milk in bags. Why? If you buy milk in a plastic jug in Ontario, there is a 25 cents depost fee. It also helps keep all those plastic jugs out of landfills. I learned that the Halmation Beach Flex Brew coffee maker is flammable. My dad told me this after my mom bought it for my grandma, luckly we didn't open it so we can return it. Going to watch my dad race I learned that the reason he was not getting traction was because he made so much tork with small tires he was spinning. I learned to through a frisbee more accurate. I have learned how to buy a good car for a cheep price thanks to my uncle. I learned a magic trick with a bowl of water some pepper and a dab of soap. I learned how to not get hurt in football I also learned that school is going to be awesome because the chromebooks. I intentionally put all of them here. I didn't edit them (except change names). I wanted you to all see how much they do and how much difference there are in all of them. As you can see, my students were active learners. It was a lot of self-selected learning as well. Nothing from a textbook. No teacher told them what to do, how to do it, or what project to do. There wasn't a rubric. No grading. No checks for understanding. I don't think people view learning as learning outside of school. Maybe they think of it as simply, life? I'm not sure. Each Monday, when students come in, I have them do a 3-Word-Weekend-Update. It lets them share about their experiences and also not take up the entire period. I sometimes add, "and one thing you learned." Students seem to struggle with this because they don't view life as a learning opportunity. After some cajoling and helpful guidance, students start to see that learning does happen outside of the school walls. Instead of "What did you learn at school, today?" we have to shift our focus to, "What did you learn today?" The topics can go so much deeper and thoughtful than what they learned in social studies or reading. When we're sitting around the dinner table (does anyone do that anymore?) we need to talk about what we learned about life. Instead of a daily journal that tells what you did, how about one that talks about what you learned? Instead of talking about what you learned at school, how about, "What did you learn at school today that can be applied to life outside the classroom?" Instead of focusing on subjects in school, how about focusing on characteristics of good (or perceived good) students and how they attack their school work? 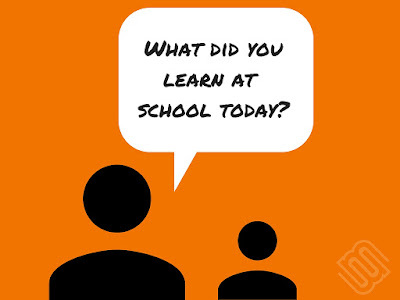 Instead of asking what problems you have to do in math, how about, "What are some things you learned from others today?" I've written on homework before, but I also know that students learn a lot outside of the school walls as well. There are a lot of people and experiences that go into a child's "schooling." From the math I did at the beginning of this post, I only meet with students for about a month over an entire year. That's not a lot of time. Look at how much is possible to learn outside of school. It's endless. It's different for each person as well. There is a lot of learning going on outside of my classroom. Teachers are just a piece of the puzzle.